Greetings everyone. Before I begin this channeling I would like to tell you what I was told by my guides and what I was shown. The Avalanche Portal that is coming up on October 23rd is exactly as the name implies, it is an Avalanche of experience. This portal is an incredible amplifier of EVERYTHING that is within us. An amplifier of BOTH polarities, which means that whatever you are going to walk with into this portal with on October 23rd will be amplified. Meaning if you will have a “negative” outlook on your life, ALL These fears and apprehensions will be amplified! All of your fears that you have not had a chance to deal with just yet, will be brought onto the surface for you to examine and finally LET GO of. If you walk into this portal with a positive outlook, beaming with excitement and anticipation of most beautiful experiences that await you, as well as focus only on the positive outcomes in every situation, this portal will bring you MUCH success, abundance, health, and everything and anything you can possibly imagine for yourself. This portal will reflect back to you what YOU ARE. This portal brings an opportunity to move onto a NEW PATH. And to truly immerse yourself into your own self! It will showcase to you your strength (if you allow) and weaknesses (if you allow), and will propel you onto new heights only, and only if ,you will be able to LET GO and TRUST that all is going according to DIVINE blueprint of your being. Therefore in the days leading up to, during and post this portal it is HIGHLY important to make time for YOURSELF. To truly open up to your own soul, having the courage to see yourself for who you truly are, letting go of fear, and embracing yourself with LOVE that you give to OTHERS. This time is all about YOU. Allowing you to go to the depths of yourself and emerge with the knowledge of what you are doing here. And not just knowledge but an actual pathway, a roadmap if you will, of what you are to do with your life. I have also received a message from Arch Angel Metatron which I was told to incorporate into this channeling. I will talk about it after the channeling form the Hathors, it’s quite an important message to assist you in preparing for this portal. Once again you can work on yourself at any given moment in time, however there are certain days where certain portals open up for us to partake of. To sum up: the coming portal is to be celebrated, and utilized to the best of your capacity allowing it to stir you in the right direction for your soul. The avalanche portal of discoveries of the past and the discoveries of the future, shall ring true to the ears of those who are familiar with said statements. Shall ring true to the ears of those who understand innately that which we speak of. For through the Avalanche portal of your known understanding of personified existence on human earth, you shall be granted access to the highest octaves of your higher self. Through the Avalanche portal of the Emerald frequencies and recognition purposes. For the emerald principles of your being shall propel you to the recognition that indeed such frequencies are plausible and comprehensible in your world. For indeed the Avalanche portal is that which shall propel you to and open the door to your home planets, to the destination of that which you all hold sacred. 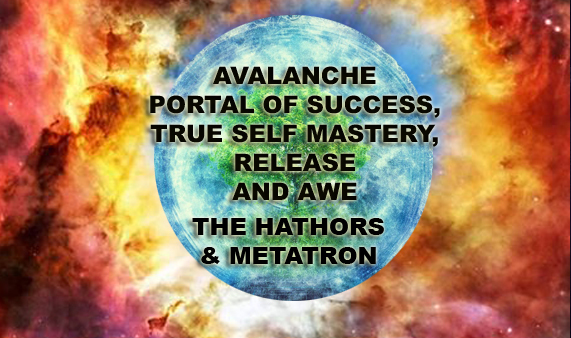 The Avalnch portal of abundance, restoration, recalibration, balance, peace, harmony, health, love, fruitful endeavors, aligned opportunities, significant encounters… ALL this is coming your way, all this is already available, all this can and shall be found in the Avalanch portal of the coming new moon. The Avalanche portal of abundance, health and joy. The avalanche of love and affection, the avalanche of prosperity, benevolence and peace. For through the encounters with the divinity of your being, through the strength of perseverance, through the abundance of thinking patterns, through the recalibration of your thought processes, through the allowance, and release of all that no longer shall occupy your frames of existence, through all that is all that is not, you shall find the necessary decrees, the necessary steps to take in the fruitful discovery of where you presently are and where you are yet to be. WE the Hathors, the forefathers of your known world. The foremothers of your know existence. Are standing by you, ready to assist you in all that you are. Ready to guide you. Ready to be guided by you. Ready to assist all our children in reaching the highest destination of your being. 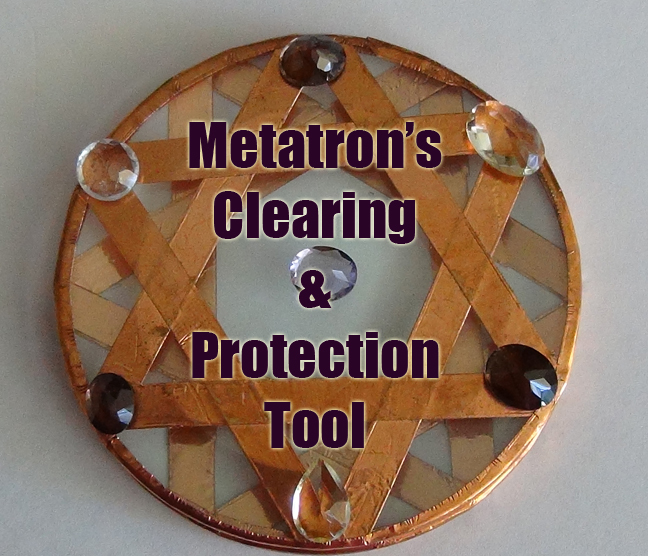 As I promised here is a short message to all of you from Arch Angel Metatron. 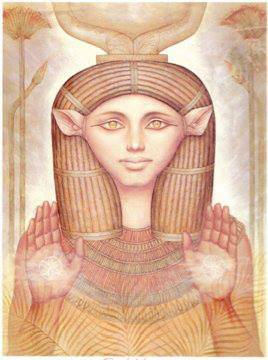 “Dearly beloved children of GAIA, as you move through ascension corridor of your own creation, you shall assist GAIA in spreading her wings once more, you shall assist her as you are assisting your own selves, and in doing so you shall raise your vibrations ever so much. For the true essence of being lays in the understanding that you all are connected with the divine, you all are connected with your very own selves, you all are connected with GAIA and all of the universe. For all is ONE and one is ALL. And so, you are to seek out a stone of high purity and abundance, a stone that shall bring you closer to the understanding of that which you are , a stone that shall release the lay lines of your being and align you with the lay lines of GAIA. The exquisite formation of extraordinary desires inset in the classification doctrine of GAIA’s purest form of expression, can be found in the aragonite directive within the structural element grids of her being. Through the aragonite principles it is then plausible to establish an understanding with the connectedness that many on you planet are lacking and are indeed desiring to experience. For the frequency that this particular design carries can permeate through your being at high capacities and re establish the link long lost to the archonic influences of your known world. For those of you who do not know about Aragonite. This is a strong stone to heal the earth, and to heal you… both emotionally and spiritually. It resonates strongly through the base chakra and the earth chakra to release excess energy… and spiritual grounding into Mother Gaia. The vibration of these stones aids you to feel a stronger sense of support and connection to the earth. The energy of Aragonite Star Clusters will balance and support your lower chakras… and provide you with a feeling of stability within your life. These stones have an excellent vibration for allowing you to feel more grounded, fully present and centered. They may aid you to be more patient and to be more content about your life circumstances. 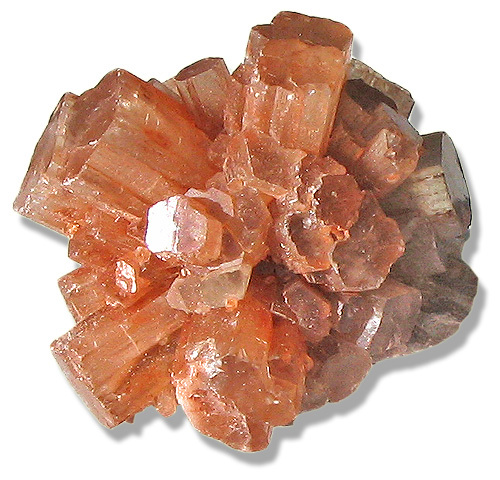 Aragonite Star Clusters have a strong spiritual vibration and are excellent to aid meditation. As during meditation, they are known to bring visions of forgotten memories… both from this life and past lives. It may be challenging to have these memories that you would rather have forgotten, come back to your attention. As this is quite common when using these stones, it is highly beneficial to use the Aragonite Star Clusters before meditation, to enable you to be more prepared. They will clear your auric field of disharmony, then balance your chakras. The energy of this stone may bring your vibration to a higher point, in preparation for making contact with spirit. 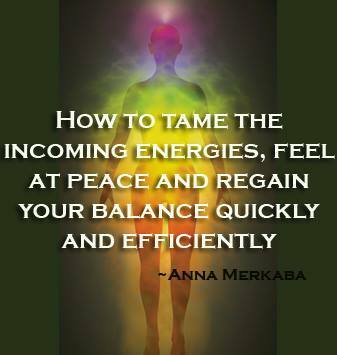 Once it has succeeded in raising your vibration this energy then flows through to energize the physical body. Meditation with this stone may vividly bring back old memories, both from this lifetime and past lives. Once you have released these memories, the subsequent meditation with these stones will be quite different. Once again thank you for listening. I love you all and am sending you an AVALANCHE of prosperity, abundance, health, love and light! 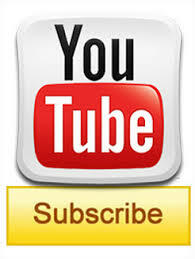 Wow huge channel! Amazing, thank you. I love the part “And a such opening the channels of communication not only with the deity of your choice, but most importantly with the one that you are longing to connect with, and that is yourself.” that really spoke to me. Thank you Sharon 😀 ❤ Much love to you!!!! I like the phrase: ‘Through All That Is…All That Is NoT!!!! Wonderful information. I am so excited, I have recently started to be aware and feeling the different energies every time a new portal opens or some energetic change occurs. I’m recently awakened, your messages have had a lot to do with this. Thank you. I just placed my order for the crystals! Wow things are changing fast! And it is Diwali….the Indian Festival of Lakshmi, the goddess of abundance!! Absolutely amazing channeling message! Thank you so much dear Anna! This is such great news! Timely Re”Blogging …5:57 pm …let it all go, that which no longer serves you and your highest good…. Life Vest Inside Dance for kindness 2014 strong event and message look it up on Google…..7th Of November very Strong international movement!!! !